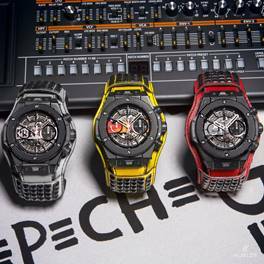 A final detail making the Big Bang Depeche Mode “The Singles” collection even more exclusive: a Roland JP-08 synthesiser will accompany each timepiece. The Roland JP-08 is a limited-edition synth module from the Roland Boutique series, paying homage to and recreating the sounds of the legendary Roland Jupiter 8 synth, used by Depeche Mode throughout the years.Legendary luggage manufacturerRIMOWA has created a cabin size Topas Stealth suitcase in anodized black aluminium to showcase this unique collection. This sleek custom-made case will protect each package – the unique timepiece, synthesiser, corresponding vinyl single and certificate of authenticity signed by the band. Net proceeds from the sale of the 55 unique pieces of the Hublot Big Bang Depeche Mode “The Singles” Limited Edition will be go to charity: water, as part of the larger charity initiative between Depeche Mode, Hublot and charity: water. 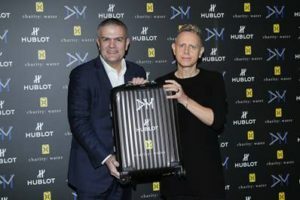 Hublot and Depeche Mode will officially present charity: water with a cheque for all funds raised during the partnership.